our work looks that good. 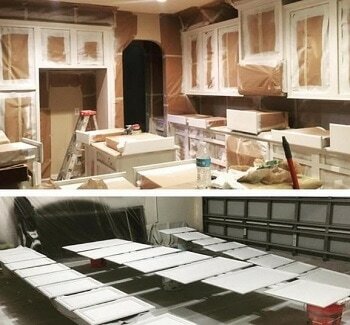 NEED BATHROOM OR KITCHEN CABINETS PAINTED? Call us right now, we are in a discounting mood. Carefully and quickly, that’s how we work. Fixing a kitchen so it looks brand new is a skilled scope of work and requires detailed planning and preparation. If there is too much warping or wear and tear it becomes difficult to guarantee our work so we make sure that everything is in decent shape allowing a pristine finish. The doors and panels are removed and carefully stacked and transported to our finishing studio where they are prepped and sprayed with your new selected finish. Cabinet frames and areas exposed to the eye will be professional finished on location and will include any repairs deemed necessary. We usually do not refinish shelves but that is always an option. We do not look for shortcuts, the finished work must pass inspection by us and you must be delighted with the work. It takes a steady hand and practiced coordination to spray paint with precision and accuracy. We have years of experience to be able to do the job to top standards. Finally, House Painters of Vaughan performs a thorough clean up, the best in the business. Unfortunately we are not available for regular house cleaning. We can give you a FREE estimate. Choose Upload File and take a mobile picture of your cabinets. 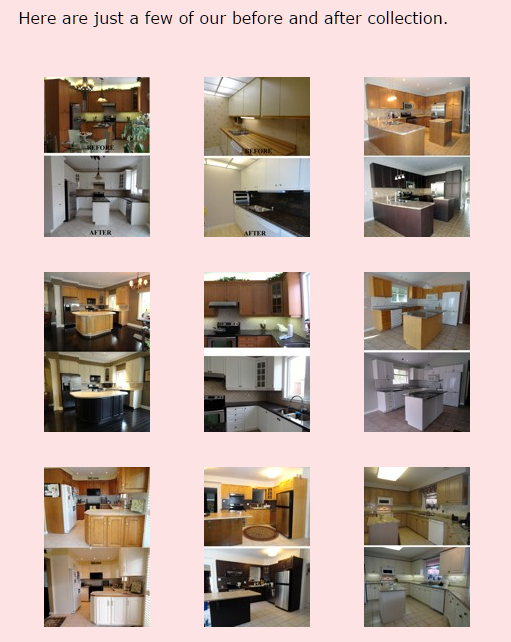 If you have been looking into renovations, you have discovered that the most popular room to renovate is the kitchen. It's also quite possibly the most expensive, certainly on a square foot basis. Now, if you have decided to that it might be time to update your kitchen because you have simply tired of the look, or you are seeking more functionality, then it's also time to think about the expense of the changes you have in mind. When you look at the cost of cupboard and cabinet replacement, you will be quite surprised at the cost of them. 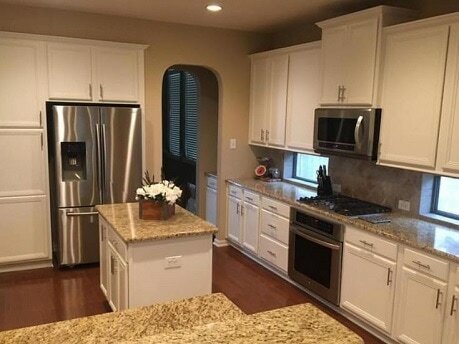 At this point you should be considering cabinet repainting as a way of extending the renovation dollars towards other interesting aspects of upgrading the kitchen such as counters, flooring and back-splash. We make ourselves available for in-home consultation and we can work with you to ensure you are on the right track with your efforts, we will share our knowledge and show you products that will make your cabinets jump out and change how you feel about the old kitchen. 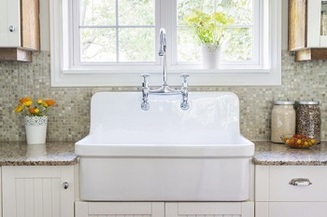 Studies have shown that kitchen and bathroom two rooms where you can expect to see the best returns on renovation dollars spent so anticipate a solid return on your reno decision. The cost of new cabinets is pretty dear and they don't have to be custom made either to be expensive. With professional painting and with custom hardware, you can get what you want at a fraction of the cost. Why not consider repainting your cabinets and saving a truck load of cash. With a shiny new cabinet finish and new hardware (knobs and/or hinges), and a contemporary color for the walls, you will feel like you’re in a new place. Leave it to the experts as repainting cabinets can be a bit of a tricky process with all of those nooks and crannies, and the various elevations. 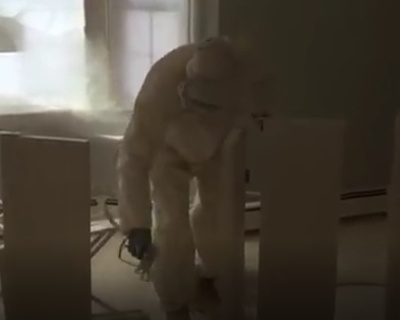 We have the expertise required make your cabinets look new again but remember that it’s not always possible as the cabinets and doors do need to be in good condition before we recommend painting them.